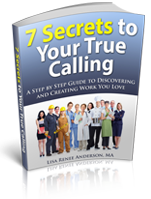 Thanks for downloading 7 Secrets to Your True Calling Workbook. You will need to confirm your subscription—so check your email and click on the Confirm Subscription button. Once you confirm then a second email will arrive with your download link. This may take a few minutes. If you don’t see the email be sure to check your Spam Folder and add lisa@exceptionallivingcoach.com to your safe list. Be sure to set aside some time to do the exercises in the workbook so you can achieve the results you want. You won’t regret it. As a special thank you for getting your copy of this workbook I’d like to offer you a free Your True Calling Strategy Session with me. [jwplayer player=”4″ mediaid=”707″] It’s simple to sign up. Just fill in the boxes below and click on Submit. I look forward to talking with you soon. If you use Gmail see below the boxes. If you use gmail, look at your account to see if the new “tabbed” inboxes have been turned on (you’ll see the new tabs across the top of your emails). Click on the Promotions inbox tab. Drag any emails from people you actually want to hear from (hopefully, that includes me: lisa@exceptionallivingcoach.com ) and drop them onto the tab that says Primary. Then, when it asks if you want future emails to go into your Primary inbox, just click yes. For the next few weeks, as gmail phases these new tabbed inboxes in, be sure to check your Promotions inbox to make sure nothing else you really want is getting caught in it. Oh, and BTW, If you want to totally turn off the new tabbed inboxes (which I did ASAP, because I don’t want anyone else “censoring” the email I’ve asked to receive), just click on the Settings “gear” image at the upper right corner of your inbox and select “Settings.” Click the “Inbox” tab and uncheck ALL of the categories except “Primary” then save your changes.